Welcome to the AXIe Newsletter, Sept. 2013 issue. We have three articles in this issue as well as highlighting some new AXIe products from our members. 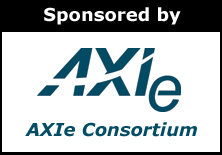 First, AXIe Development Tools Debut at Autotestcon, summarizes the availability of two new development tools that will greatly enhance the capability of vendors and system integrators to produce and deploy AXIe instruments and systems. Second, we have an application article, How to use an AXIe Digitizer-based Solution to Perform Multi-antenna Array Measurements, which describes an innovative solution for accelerating calibration of multi-antenna arrays using a high-speed, multi-channel digitizer with real-time digital downconversion (DDC). Finally, we offer an educational article on revision 2.0 of the AXIe Base Architecture Specification. Two new vendors of AXIe products, Elma Electronic and Hiller Measurements, announced powerful development tools for the AXIe modular instrument standard at Autotestcon 2013. The tools are designed to help vendors and system integrators quickly develop and deploy AXIe instruments and systems. Elma Electronic, a well-known vendor of AdvancedTCA® products and platforms, is now offering AXIe products. For chassis developers, Elma Electronic has developed an AXIe IPMI (Intelligent Platform Management Interface) Shelf Manager card with redundant IPMB (Intelligent Platform Management Bus). The shelf manager’s system monitoring features include power management, cooling control, event sensor logging, electronic keying, and module hot-swap monitoring. This application note describes an innovative solution for accelerating calibration of multi-antenna arrays using a high-speed, multi-channel digitizer with real-time digital downconversion (DDC). The solution characterizes the element-to-element phase and magnitude errors of the various compo­nents in the array. The misalignment of the radiat­ing elements can then be accurately identified and calibrated out to ensure efficient operation of the antenna system. In an array of antennas with hundreds or thousands of elements, where it is necessary to characterize the phase and gain alignment between elements, the ability to accelerate test by using multiple coherent measurement channels is a significant benefit. Of equal importance, as technology evolves and antenna configurations continue to have higher and higher antenna element densities, is a scalable platform that can accommodate additional parallel channels. 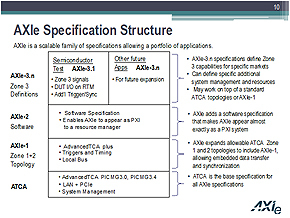 The AXIe Base Architecture Specification (AXIe-1) defines the standard for most AXIe instruments. It is layered on top of the AdvancedTCA industrial bus standard, with extensions for instrumentation. It is the second layer in the AXIe specification table below. An additional specification is AXIe-2, a software specification to make AXIe products appear as PXI products to an instrument controller. Finally, AXIe-3.1 defines extensions for semiconductor test. Revision 2 of AXIe-1 was released at the beginning of September after ratification by the AXIe Board of Directors. Revision 2 is the result of extensive interoperability testing between vendors, and modifies the standard to improve interoperability or define new capabilities.